Trish allowed us to use one of her photographs for the cover of Grime Kerbstone Psalms and both me and Miggy were thrilled by this. We saw her work at an exhibition she held at Antenna, a venue in Nottingham that correctly describes itself as a ‘hub for creatives’. 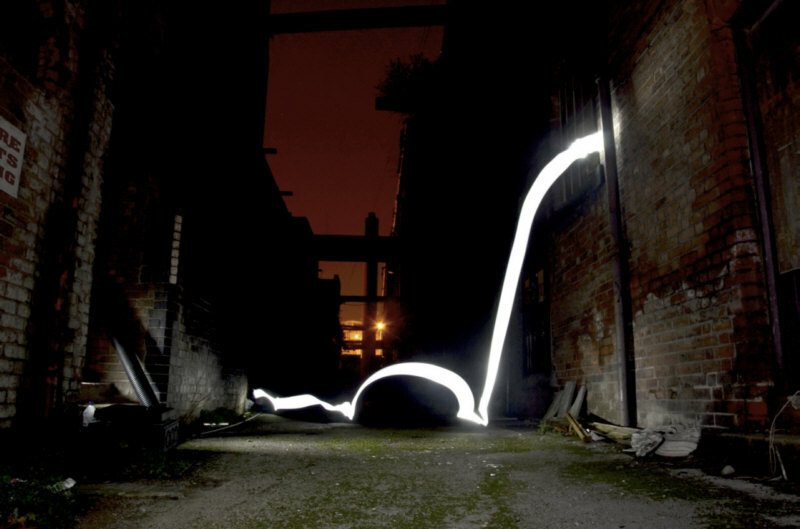 Here is the original photo which (using time lapse photography) shows the journey of a free runner with lights strapped to his leg as he travels through a deserted factory. Actually….. for our purposes I had to mirror rotate the image and crop it to size. This meant the writing on the sign which you can just see in the top left of the picture was reversed. I replaced the reversed text with the words “Beware Poets Working” which you can just see the tail end of…..
More on Trish here. (She’s bloody good you know. I think of her as Nottingham’s visual answer to Laurie Anderson).